I was thinking of dear Mr. Wendelin today! So glad for your post. 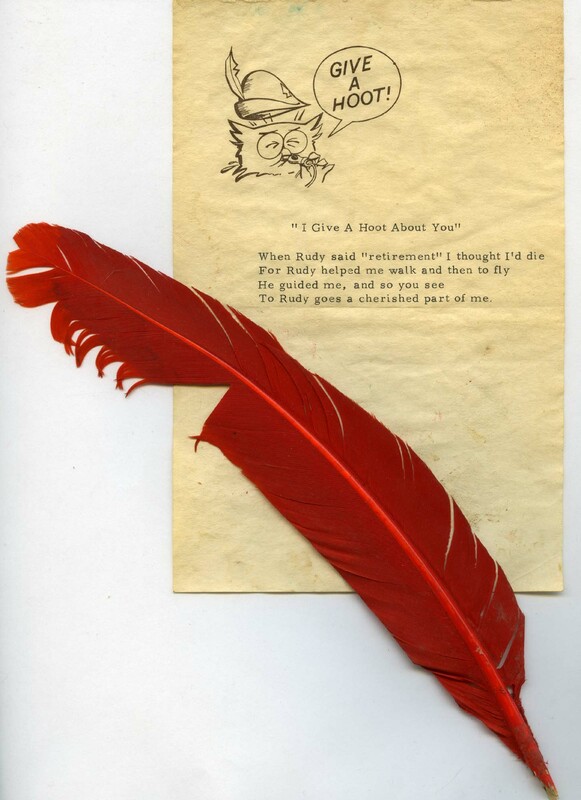 Harold Bell’s family would like to thank you for your interesting narrative concerning the history of Woodsy Owl, and especially for including my father’s original drawings of Woodsy and his correspondence with Mr. Rudy Wendelin. It’s great to know how closely they both worked on bringing the Woodsy Owl character to life and insuring that this environmental mascot would last until today and I’m sure for many years beyond. As you might know, Harold Bell passed away at age 90 on December 4, 2009. He would have gotten great pleasure from the recounting of this wonderful story. THANK YOU FOR GIVING A HOOT! I am in no way trying to cause you or yours distress but the truth needs known! In the 1969-70 school season my sisters 4th grade class took part in a contest. The contest was for the best poster to represent the upcoming founding of Earth Day. My sisters name is Kathleen Beaudoin. Kathy was informed that her poster won that contest, nationally. Her poster creation was an owl, sitting on a branch with a thought cloud above its head and the phrase” GIVE A HOOT , DONT POLLUTE!. The phrase was taken from our grandmothers favorite saying “I dont give a hoot and holler”. We moved from Columbus that year and Kathy was never recognized for her contribution. I have 4 siblings who all remember this. Now, I dont doubt that Harold had something to do with the selection proscess but the idea for give a hoot and the owl came from that poster. Funny, I made the same poster in second grade ,owl, tree ,balloon with phrase. Give a hoot don’t pollute. However my poster was never returned after it went to the art gallery. Michigan not Ohio. a debate question – and sure enough I am not the only person who incorrectly thought it was Hooty or Hootie the owl. But one person calling themselves by an icon with alter identity did take a minute to correct the misinformation – and that led me to your site. And now I understand some of the things which went into the creation of Smokey and Woodsy. a cherished character from my childhood. thanx for the post. I do not wish to take any credit away from Howard Bell for creating Woodsy the owl, however I might add my sister Elizabeth Gavi created the same owl in a contest in Germany for the first Earth Day. Note the german style hat Woodsy wears. My dad always said my sister was the first persons to create the phrase Give a hoot don’t pollute and woodsy the owl when she won the contest while my family was living in Frankfurt, Germany. I also remember the poster my sister made that featured the owl with the German hat for the contest. It is truly the same owl and the same phrase my sister used before anyone else did. Maybe someone should give her credit where credit is due. When as an elementary school student around the 60s and 70s, my brother and i had to do a poster on pollution. We decided on this very same idea, WOODSY OWL. My brother drew the Woodsy owl and I came up with the logo;Give a hoot, dont pollute. How is it that somone else came up with the same thing? I had won 1st prize and no national recognition, why cause i was a child? Our art Teacher was Mr Forrest Whittaker, From Maddison Elementary, In Coos Bay Oregon. I was so proud of our work. Didnt know someone else would take claim. I understand that there was a competition where school kids prvided their ideas for the slogan and give a hoot don’t pollute was the winning slogan. What was the name of the child who won the competition? Is their anyway to get my winning poster? Please let the truth be known. I Steven A Ritt won the contest.While at a grade school I attended in St. Louis Park Mn. Here is the truth how I drew him the early woodsys the made looked just like him, i also gave him the name and put it under the image[I did have a little help from my wonderful teacher] but back to how i drew him at that early age know how when your a kid you draw turkeys outlining your fingers. I did the same concept putting all fingers together upside down on the paper[the tail feathers] then just completed half circle for the head, a V for a beak, 2 lines for folded wings look 2 oval shaped eyes. and stick legs its a childs drawing and it was me as a child. For so many years I never thought about it as I struggled to make my mark in life. and I did end up working with animals even having a famous one. Even as a child I always loved animals and hated litter. so maybe I was passionate about it. I am not seeking any compensation But I do think it only right the truth come out and be known. I actually loved the campaign it replaced the Indian shedding the tear. as people drive by and throw trash from the car. I speak the truth[write that is] I wouldnt bother writing all this if it were not. One more thing, Oddly enough I almost became a forrest ranger. When doing the tests in school for what you would be good at for a career, Forrest ranger almost always came up first. I became an animal trainer instead. Sorry for all the typo’s in my last responses. This was a fascinating and informative article, but can you guess why I looked it up on the internet in the first place? I’ll tell you. I too thought that I had invented the slogan “Give a Hoot. Don’t Pollute!” when I was just a second or third grader. For years, this memory of doing an ecology poster in gradeschool has haunted me (haunt may be strong) and I believed (a little bit) that some teacher had sent in my poster, and I never received the credit I deserved for being the one to come up with this famous slogan. Looking at the other comments to this article, I see that I am not the only one to have held this belief for so many years. Certainly, all of us couldn’t have come up with the same slogan as second, third or fourth graders–could we? Not likely. We have probably wished it for ourselves. Wouldn’t it be nice if the truth were really known–if the world knew about us we mused. I am thakful I can move on. (I did in the 70s). Third grade was more difficult though facing the cruel truth that this life wouldn’t give you what you deserve. Thank God for the next Life, and that knowledge that He won’t give us what we truly deserve there either. This is a poster on pollution, I’m not gonna give you a bunch of garbage, I’ll just let you get the picture by yourself. I was 13 years old at the time and I am now 51. I was told that my poster would be turned into a commercial, the result was the crying Indian which was a wonderful thing the team working on the pollution commercials added to enhance the initial idea I conveyed on my poster. Loved the week at camp and loved the end result of my poster. Thank everyone for their candid comments. Vivian I am amazed to know your story and feel impressed as everyone else in the thought, concept and idea processing! Kudos! The little girl that won the contest lived within a secluded area of the Ozarks. She had been a victim of kidnapping as a toddler and her family sent them there after changing their identity. They lived next door to the newspaper editor of “The Daily American Republic”, DAR and his wife where she would climb the magnolia tree in the front lawn of their home alone. Her parents had no intention of exposing themselves or the daughter to the world at large. Her identity would remain a secret. She grew up in those hills experimenting with natural science and grew up to become an illustrator, naturalist and social scientist. Her slogans and illustrations have become educational worldwide. Humanistically she was never interested in the fame and fortune others have used to exploit her characters. She has kept originals fully aware everything is public domain. For her the importance comes from the intention of the thought process and the sharing (doing) what is right for humanity and nature. By the way I hear she has developed a new look for “Woodsy”, upon request by the state, local and federal governments and will be releasing them soon. The owl has grown up! I also competed in a contest back in early 70’s. I grew up in So. California and our class was told that we won. Was this a way for the kids to take pride in their environment? If all of us was told we won, it must have been a marketing ploy. I just know that 5this grade was my most memorable year. I am from Southern California and remember the constest well. My class participated with our teacher – Mrs Harms – she was not so nice after the contest. We were told there was a contest and to color the owl with a rhyming phrase. My drawing was the owl on a bicycle saying “give a hoot don’t pollute,” after some time we too were told the class had won. Everyone got thier drawing back except for me. I had shown my mother the drawing with the saying, she told me it was very very nice. I truely do not believe the person getting credit for the slogan is the true “one” who came up with it. Pollitics in second grade even. I asked for my drawing back from the time we won, asking my teacher for it a time and again – now from that contest on I could not figure out why she disliked me so. Well years later I started to see my slogan everywhere. After reading the above comments I do believe that more than one of us could of come up with the same slogan for adults in thoses days would say “i don’t give a hoot or holler”… simplicity in a child. But those stupid adults – we all were given pizza instead of the truth. San Diego – Carver Elem. Ok so I have the same memory of doing a poster contest and I did win first place of $50 and a tv for our children’s hospital. This was when I was in about 2nd grade, back in the 70’s. My drawing was of an owl and the caption was also “Give a Hoot Don’t Pollute”….I think we all were brainwashed where there was an experiment of what kids would think up for the pollution slogan for the already created owl. I live in Denver Colorado where one of the creators was working at the time, see the letter above. The child who put the slogan on their poster was probably the winner in that school. I never knew so many of us actually thought we created the slogan, Crazy how reality can change your concept of memories of your past just from searching a topic. Gina Barnes Rinks-Add me to the list. About a year before Woodsy came out, I entered an ecology poster contest while in the Girl Scouts. By the many accounts here,it must have been a National contest. My poster featured an owl in a tree and the slogan was “Give a hoot,don’t polute, and help the Girl Scouts keep America beautiful” My poster won 3rd place in the city of Milwaukee. 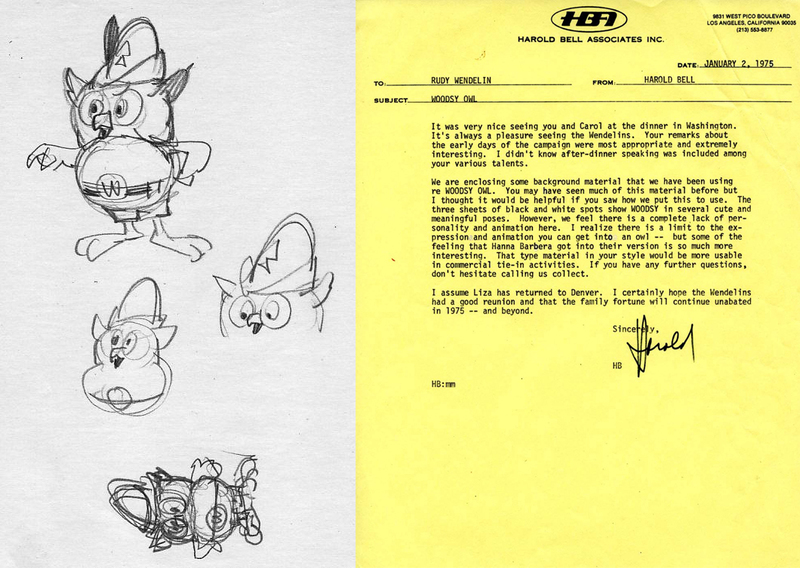 So it sounds to me that while Harold Bell may be credited with creating and marketing Woodsy, he may have been inspired by a bunch of 7-8 yr old kids.I can live with that. Actually, it was my idea back in 4th grade. In 1966, I was 10 years old. If any of you have any memory at all you should remember meeting Activist Dennis Hayes, later Senator Hayes of Wiskconsin. He approached Senator Gaylord, who later made him the official orginazor of Earth Day. Earth Day was Dennis’s idea and he hitched hiked rides across the USA to various grade schools and sought ideas for a concept known as the first earth day. He sought parental permission but my mother said ask the one who did the film. Films perserve copy right no matter how many children come up with the same or similar idea. I still have the film which won the honor, but Dennis sold the rights I gave him for the first earth Day to the Us department of forestry. I was a pupil in the class of the student who came up with that slogan in a contest in Elementry School in the state of Virginia. His name was Steven. I would love to reblog your piece on my site–are you willing? Yes, you’re welcome to repost our article on Woodsy Owl. Please give proper attribution when you do so. Ironically, back in the 70’s I was attending a summer day camp in my neighborhood in NYC. In one of our classes we too were asked to do a poster regarding earth day. Since I am not an artist, my owl wasn’t exactly “Woodsy”, however I did come up with the “Give a hoot don’t pollute” slogan. After reading all of the replies, I surmise that the marketing campaigners were clever in that they posted these contests where they would pick bits and pieces from various posters submitted and came up with the final campaign and since there are bits and pieces from each of our posters not a one of us can place claim, except for the self satisfaction that I came up with that. I had a talking Woodsy the Owl I got back in the late 60’s for my Borthday. I had him for years till my now exhusband left me in 2006. I would love another I know it won’t be the same one but I still would love one, he and I went through alot as a child. My email is. ydnew101365@gmail.com, can someone.let me know please.. Okay so I’m really confused as to how so many people remember as children creating this idea of the owl AND the Slogan. My mom told me casually (with absolutely no reason to lie or make it up) basically the same story as several other people in these comments – she won the poster and slogan competition in elementary school and won an award for Give a Hoot, Don’t pollute and drawing an owl – I’m not even trying to go all “she needs this credit” – I actually was just looking into it because I was thinking about it after looking at owl-related items to get her for her birthday. I dunno, it’s just weird. I think we were just talking about art in school or something when she told me about this, again, many years ago, probably when I was in Elementary school. I’m reeeally curious as to what’s up with this. My mom never cared about recognition nor sought any, so the story was just a small thing. Curious, very curious. Well it looks like they ran a contest to come up with the perfect slogan,and they did.I remember vaguely the contest in grade school ,it was for a slogan to stop pollution ,if you thought of a Owl of course you would think (hoot)(pollute)? The Bear was fighting fires”. Anyhoo! It may be impossible or very hard to find the original one….If anyone from my school can remember the year we had the contest please post.thank you. Galena Elementary,South Bend,Ind. It was a child that entered a school contest for a Pollution Slogan that was the Original Designer of the owl with the slogan” Give a Hoot Don’t Pollute”. It’s a shame they were never given recognition. WELL My name was Cindy Roark I also created the slogan Give A Hoot Dont Pollute with the Owl When I was a young child In school in New Castle Delaware. I was told I had Won The contest for best Earth Day Poster .. Then All of a sudden My Poster was removed and I was never recognized Again .. Until One day I saw The Poster that I .had created .. How devastating for any child to know there idea was stolen..Because of this I now suffer PTSD. AND I am Paranoid I have to carry a gun around all the time AFRAID someone will steal something else from me . Or my child….LOL OK I was JUST KIDDING ABOUT ALL THAT BUT I really did draw the owl and made the slogan up myself….I do believe all these other people did the same because we were told to make a slogan about dont pollute and Give a Hoot Just came so easy .. I think all of the children at that time should have been recognized because it is Really Wrong to steal especially from Children ….. THE TRUTH WILL STAND WHEN THE WORLD IS ON FIRE Thats all I have to say…. oh my gosh! similar story here also~ I won a contest also using the slogan give a hoot dont pollute with a pic of an owl,,no wonder it is used, everyone one of us had the same idea,,,lets see this was in Mrs. Kern’s class? 4th grade for sure and would have been in…..70-71? same here about seeing it later and was made fun of when i was excitedly exclaimed my poster! give a hoot don’t pollute makes me think of the 70s and brad cowan at the essex arena singing that’s the way it is truly uly uly is so what you going to do today? give a hoot don’t pollute!